In dental implant surgery the implants are placed directly on the jaw bone inside the mouth. After the implants are fixed small posts (abutments) are placed over them. These abutments act as anchors for the prostheses of teeth which are placed on them. Cap or crown is used for single tooth implant and bridge work or dentures are used when there are more than one tooth depending upon the requirements of the individual cases. 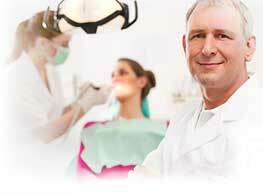 Dental implants procedure is usually done as a two stage procedure. In the first stage the implant is attached to the jaw bone. In the second stage the prostheses are placed over the implant. A very important requirement for the quality and success of a dental implant is the availability of good quality jaw bone to the required extent. If the jaw bone available is insufficient or of poor quality, then additional procedures such as bone graft or substitute bone grafting will have to be depended upon. In some rare cases procedure like sinus lift, ridge modification, guided tissue regeneration (GTR), etc are also done.